Kipapa Field was situated on the central plateau of Oahu 15 miles from downtown Honolulu on the road which leads to Haleiwa Airport. In addition to being more conveniently located to residents of Honolulu, Kipapa Field was only four miles from the Army’s Schofield Barracks and Wheeler Fields. In 1947 there were 52 personal planes on Oahu based at Honolulu and Haleiwa Airports and four based at the small private airport near the Pali Country Club of the Air. In addition there were 23 small charter types based at Honolulu and Haleiwa Airports. A October 30, 1946 letter to the CAA Regional Administrator noted that Army and Navy authorities had jurisdiction over all flying activities during World War II and did not allow civilian flying from any airport. After hostilities ceased, flying was resumed at Honolulu Airport on a restricted basis. “This greatly curtailed flying activities, however, in recent weeks the Army and Navy have taken a more liberal view and several airports are now open for civilian use. The Airports Division of the Territorial Department of Public Works proposed that a public airport for private flying be developed in Honolulu by dredging produced fill on the reef between downtown Honolulu and the Waikiki section of the city just seaward of ala Moana Park. No particular difficulty was anticipated in developing satisfactory flight patters to control flying from the Ala Moana site and it was believed that with the growing of flying on Oahu and the perfection in the design in small planes to eliminate objectionable noise, objection to the development of the Ala Moana site will disappear. I n the interim possibility of utilizing a portion of Kipapa Field as the principal private flying center for the island was, in the opinion of the Ninth Regional Office CAA, the practicable solution. The CAA noted that the wide, deep gulch at the westerly edge of Kipapa Field caused air turbulence, and while Kipapa wasn’t ideal, it was deemed suitable for a private flying center for the Island of Oahu. “The proposed development of Kipapa, Kahuku and Bellows Army Airfields for private flying, with Haleiwa, would give a splendid combination of airports for the accommodation of private flying activity that will develop within the next few years. The opportunity to salvage a worthwhile permanent civil use from the vast Army expenditure in the airport is one that can not be overlooked in the National Airport Plan. “It is believed that it would be in the interests of the National Defense to retain the nucleus of Kipapa Field as an active flying center. If this recommendation is carried out the original airport could be readily reconstructed and re-commissioned in times of national emergency,” the plan stated. Representatives of the Territorial Government conferred with Army authorities with respect to the proposed project. The Territorial Government’s interest in the development of adequate facilities for the encouragement of private flying was very active. 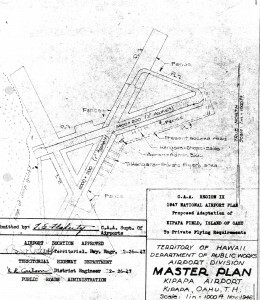 A Master Plan prepared by the Territorial Department of Public Works in November 1946 was approved by the CAA Region IX as part of the 1947 National Airport Plan. 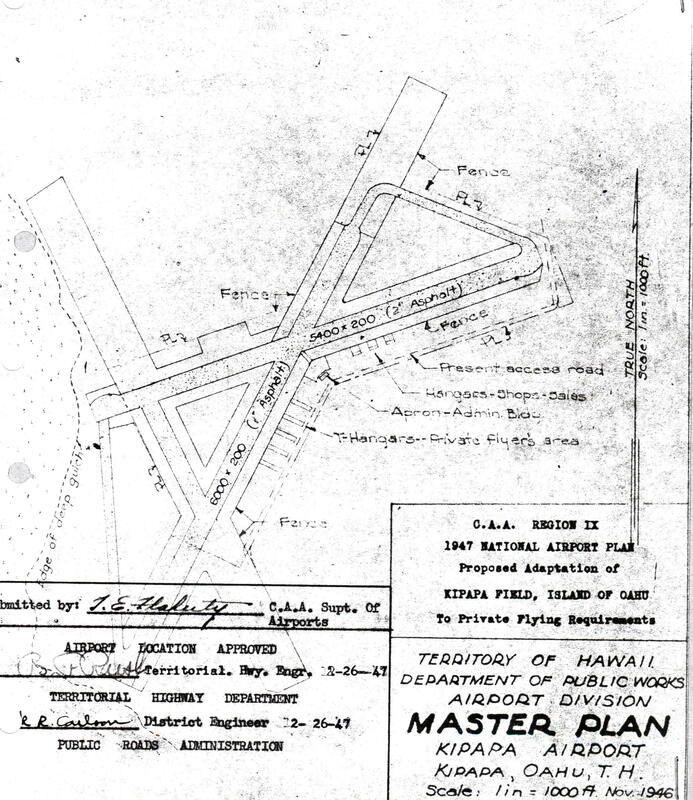 On July 1, 1947 the airport was placed under the newly formed Hawaii Aeronautics Commission. An appraisal of the airport set the value at $500,000 on November 3, 1947. 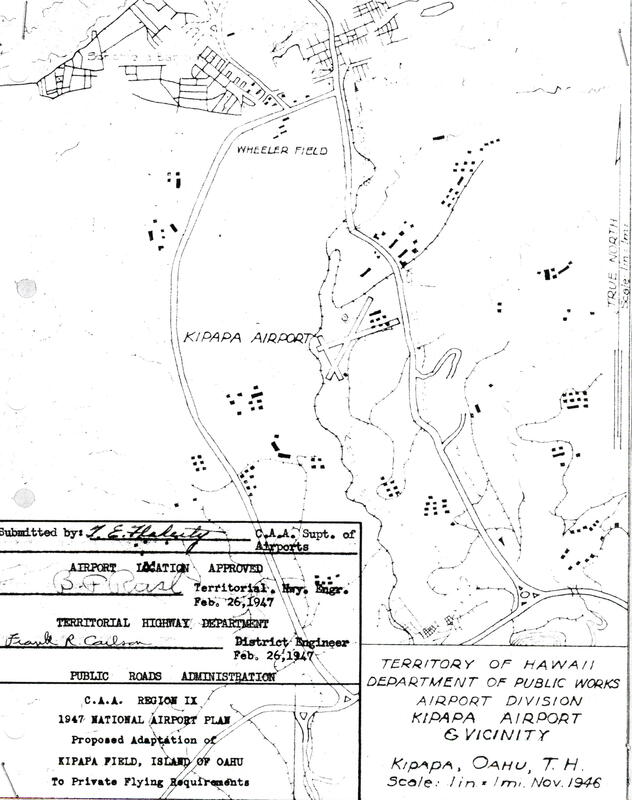 As a result, and the proposed acquisition of Bellows Field, the HAC cancelled its request for Kipapa Airfield. On July 23, 1948 Kipapa Airstrip was leased by the HAC for use by private and student fliers from American Factors, Ltd., Agents, Oahu Sugar Co. Ltd. The single runway was 200 feet wide and 1,700 feet long. 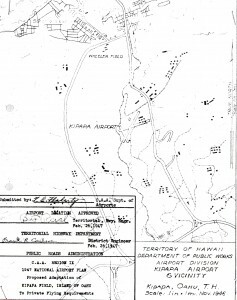 On August 2, 1948 at the request of K-T Flying, the HAC classified Kipapa Airport as unimproved land, reducing the land rental rate to 1.5 cents per square foot, as opposed to 3-cents per square foot if it was improved land. The site had no power, water, telephone or sanitation facilities. The HAC decided to discontinue operations at Kipapa Airport and cancel the lease effective November 1, 1949. On November 21, they agreed to a two-month extension until December 31, 1949. On February 7, 1950 the Director of Aeronautics requested a month to month extension of the lease on Kipapa Airport beyond December 31, 1949 for an indefinite period of time. This was approved. The Oahu Sugar Company requested that the control tower at Kipapa be removed on January 22, 1951. It was agreed that it be put out to bid for scrap. The Department of Institutions offered $50 for the tower but because the tower had been purchased with aviation fuel revenue, it had to be sold for $500. The HAC agreed to accept the $50 with the difference to be made up in services contracted from time to time. By 1951 Kipapa was used for flight instruction and practice up through first solo flight. Because of its proximity to Honolulu International Airport it was used heavily by the flight schools. A request for operation of a flying school at Kipapa Airfield was approved on March 24, 1956. The owner (Mr. Ing) was required to pay the going rate for ground rental; and approval be given to the removal of improvements, subject to the concurrence of the Oahu Sugar Company. The HAC ended its lease operation in the late 1950s.